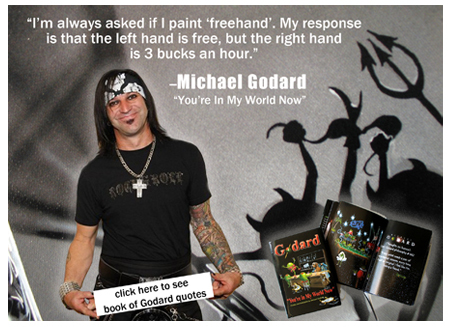 Michael Godard, The #1 Selling Artist in the World! Michael Godard martini art features olives, grapes and other frisky characters busily expressing Godard's slightly off-kilter point of view. 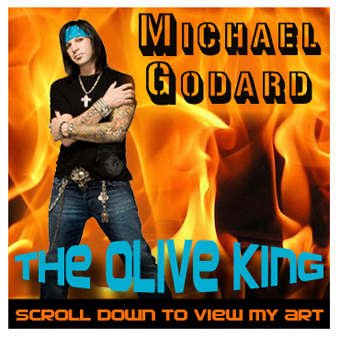 With plenty of talent to challenge the 'serious' artists, Michael Godard took his own path instead, and chose to "learn all the rules, and then break them". Born in Southern California, Godard was a precocious kid with a multitude of talents and a dark home life filled with hidden abuse. He excelled in math, music and art—quite an achievement, considering that his family moved around so much that he attended a total of sixteen different schools. Humor was always his defense and his weapon. As a young man he attended the Art Center College of Design in Pasadena and studied fine art at the University of Nevada in Las Vegas. The decision to become a full-time painter came later in his life, after stints as a mechanical engineer, commercial illustrator, caricature artist and successful entrepreneur. 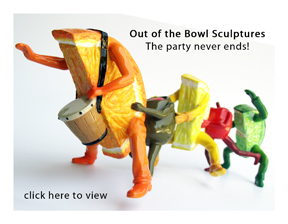 Nothing came easy—-he fought his way into an art career, inventing his own one-of-a-kind style. Olives entered the picture when Godard was struggling through his daughter Paige’s illness, spending long hours in the hospital when she was in a coma. Desperate for some cheerful element to keep him afloat emotionally, he started a new series of paintings--bringing olives to life in humorous scenarios, rendering them in bright colors against a dramatic black background. Now the country’s biggest selling artist, the “Rock Star of the Art World” creates his famous martini-themed artwork for a huge collector base of celebrities, musicians and regular folks who love his irreverent subjects and vibrant style. There’s a long waiting list for Godard original paintings and his sold-out giclees bring big bucks on the resale market. You might spot Godard on television on HBO’s “Cat House”, A&E’s “Mind Freak”, “American Casino” and “Inked”, among other places. A documentary on his life won awards when it was shown on the independent film festival circuit and his recent book “Don’t Drink and Draw” won the Art Book of the Year award. He looks like a tattooed outlaw and runs with the bad boys, but Godard has a soft streak a mile wide. He’s a great dad, contributes to many charitable causes, (including the Paige Godard Foundation, established to help fund research to cure the illness that ultimately took his daughter’s life in 2006) and has learned in the school of experience to value the things that really matter in life. “Put good in, get good out,” is one of the artist’s favorite sayings.